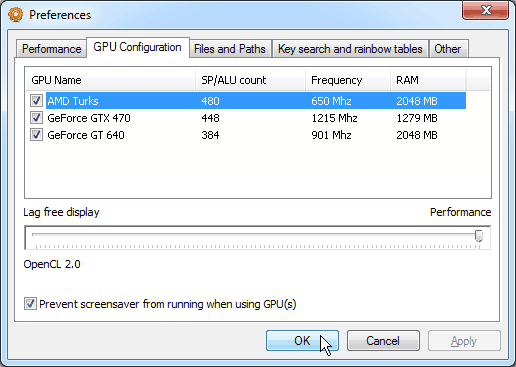 To specify the graphics card to be used in GPU computations you can open up a special dialogue window from the program menu (Options -> Preferences -> GPU Configuration). Set the desired parameters and confirm your choice. GPU devices. This contains the list of all the graphics cards detected that are applicable for GPU computations. Check the devices which you would like to engage in the password recovery process. Lag free display. This configures the GPU performance characteristics. By setting it to maximum (moving the scrollbar to the right) you prioritize GPU computations and the graphic information will lag. Prioritize the usage of GPUs by moving the scrollbar. Note that Performance tab settings may overwrites this tab settings in certain situations.